Slicetruck: How big is a slice (circular sector) of SliceTruck pizza? How big is a slice (circular sector) of SliceTruck pizza? We get this question a lot and I find it odd for some reason, but since its asked a lot, I must be odd and this issue needs to be addressed like right now. A SliceTruck pizza is made with a crust that is 18 inches in diameter. Using 3.14 as the value of pi, this gives the pizza a circumference of approximately 56.5 inches. We cut each pizza pie into 8 slices and we try to do this as evenly as possible but inevitably some slices are larger than others due to slight miscalculations with the pizza cutter. For this explanation we're going to assume all pies are cut into 8 perfectly even slices. Getting back to the exact size of a slice of our pizza, we can take the circumference and divide it by 8 (56.5 inches / 8 slices). This equals a crust or, arch length of 7.06 inches and a radius of 9 inches. Slices of pizza can be referred to geometrically as a circular sector. Using these figures the area of one slice of SliceTruck pizza is equal to 31.79 inches using 3.14 for pi and the formula for the area of a circular sector: pi * radius squared * (central angle in degrees divided by 360). Now we will move on to the weight of one slice of SliceTruck pizza (cheese slice). For each pizza pie made on the SliceTruck we use about: 22 ounces of dough, 11 ounces of sauce, 3 ounces of olive oil, 20 ounces of mozzarella cheese, 2 ounces of parmesan cheese, 1/2 ounce of fresh basil. The sum of these ingredients is 56.5 ounces or 3.53 pounds, divide this by 8 (the number of slices in a pie) and you get 7.06 ounces or .44 lbs per slice of SliceTruck pizza. These are the facts, now its your turn to make some decisions President Obama. Are you satisfied with the size of a slice of SliceTruck pizza? Would you like one or two slices? You are with two of your friends; should you all get slices or chip in and share a whole pie? Is it going to be cheese or pepperoni? Do you want a drink with that? Are you even in the mood for pizza right now? Does this truck sell tacos? 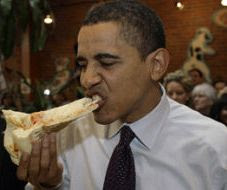 Does buying pizza off a truck as the president of the United States make my country look weak? Is this pizza stolen?